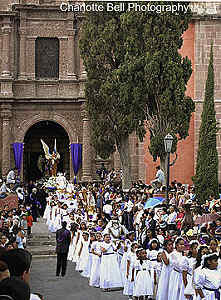 T he Events of Holy Week in San Miguel de Allende quieten down slightly during the first part the week. People go to work—unless they're among the lucky hordes of Mexicans who have a vacation week this week. (Holy Week in Mexico is a huge vacation time for millions. For many, the main events of Holy Week may be sun, surf and tequila.) There may be only one procession a day. Still, masses will be going on everywhere. Every church in every colonia in town will be having its own celebrations, including at least one solemn procession during the week. The Monday events of Holy Week include a morning mass celebrated at the Oratorio de San Felipe Neri, the beautiful church just down Calle Insurgentes from the Plaza Cívica. That night there's yet another procession. This one features an image called "The Apprehension of Christ." Jesus in chains, accompanied by Judas and Roman soldiers in appropriate costumes, is taken in a procession that ends at the great altar of the church and is placed in a jail cell. Holy Tuesday begins with yet another mass at the Oratorio, this one for the imprisoned Christ. It includes traditional songs sung by children. That evening, Our Lord of the Column is taken from the vestibule of San Juan de Dios Church and carried in procession, amid flowers and incense, to the main square. This much revered statue is part of many of the events of Holy Week. Wednesday of Holy Week recalls the abandonment of Jesus. Some churches celebrate a special mass called los matines de tinieblas, or the Vespers of Darkness. A candelabra on the altar holds 15 candles. As the psalms are sung, one candle is extinguished for each Psalm until finally, as the service ends, a single candle remains, representing the Christ alone in the garden. A touching procession takes place on Wednesday of Holy Week from the Oratorio Church in the centro. It begins with groups of women, all dressed in black, many barefoot and carrying their shoes, while others proudly and defiantly where stiletto heels on the uneven cobblestones—a different kind of penance. They carry baskets of flowers, small statues of saints or scarlet pillows holding crucifixes and other symbols of their faith. Some of the women wear printed bandannas beneath wide-brimmed white sombreros, representatives of the farmer/peasants that are the backbone of Mexico. A pair of young women, also in black, carry a wooden cross between them. And then come the angelitos, young girls in pristine white—likely their confirmation dresses—adorned with feathered angel wings. Gold and rhinestone tiaras or flower rings on their heads are their halos. On their feet, are golden sandals. They are a precious sight—one of the sweetest events of Holy Week. Next come the elegant and colorful statues of the saints, who emerge from the church on only this one day each year. The life-sized figures are carried on platforms borne on the shoulders of more women in black. They move out of the church patio, are angled carefully down the steps into the street and head uphill toward the Jardín. Finally the statue of the Christ emerges from the church, this time borne by men in black pants and white shirts. He is dressed in a deep maroon robe with a golden sash, his crown of thorns on his head, as he drags his heavy cross toward Calvary. Masses of white Easter lilies bloom at his feet. The bearers' steps are slow, a mournful cadence, and the crowd is silent as Jesus passes by. Like many of the processions this week, it ends at the Parroquia. One more of the many events of Holy Week in San Miguel has been marked and honored. Now we're beginning to get serious. Banks and most other businesses will close today and not reopen until Monday. Today marks the remembrance of the Last Supper, Jesus' Washing of the Feet of his Disciples, and the Arrest of Christ. There are special masses in most churches, where the altars are heavily loaded with flowers. A mass is said this afternoon for El Señor de la Columna at San Juan de Dios Church. Insider's Tip: Be sure to check out the altar at the San Francisco Church. It's the most elaborately decorated one in town. I first did this with my friend Charlotte Bell, who has chronicled Semana Santa in San Miguel so beautifully in her photo book, Tears From the Crown of Thorns. At most of the churches, we found long lines to get in, but they moved along nicely. People were relaxed and chatty, though once they entered the sanctuary, they became reverent, quietly saying their prayers before turning to leave and head to the next one. A special stop on the pilgrimage is the Church of Santa Ana, next to the Biblioteca, where people stop and pray to an image of Christ on the Cross. The truly special treat on this night is the chance to visit the Loreto Chapel at the Oratorio de San Felipe Neri. This gloriously gilded, over-the-top chapel is only open to the public on this one night. It is overwhelming—the eye scarcely knows where to look with all the gilding and mirrors and cherubs and angled walls. It's a must-see sight in San Miguel and its opening tonight is a much anticipated event of Holy Week. After finishing all seven churches, we strolled in the balmy evening air, munching on green garbanzo beans purchased from a street cart, nodding at others strolling the street. Everyone seemed totally mellow and...sweet. 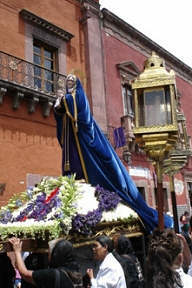 It's a fond memory of Holy Week in San Miguel de Allende. All of this week-long build-up pales in comparison with what comes next. The solemn and awe-inspiring high point of all the many events of Holy Week in San Miguel—all the processions and masses and observances of Semana Santa—is Viernes Santo, Good Friday. Click the link below for a complete description.